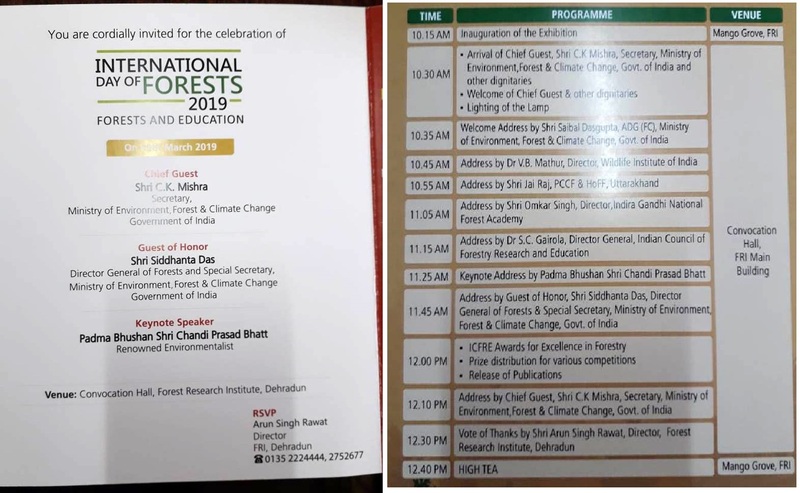 Indian Council of Forestry Research & Education (ICFRE) is hosting the national celebration of International Day of Forests 2019, at Forest Research Institute (FRI), Dehradun on Tuesday, 19 March 2019 on behalf of Ministry of Environment, Forests and Climate Change (MoEF&CC), Govt. of India. International Day of Forests is celebrated worldwide on 21 st March every year in order to raise public awareness of the values, significance &amp; contributions of all types of forests.This year the theme of the ‘International Day of Forests’ is ‘Forestry and Education: Learn to Love Forests’ aiming to promote the importance of education at all levels in achieving the goals of sustainable forest management and biodiversity conservation. The programme will be presided by Chief Guest, Shri C.K Mishra, Secretary, MoEF&CC and graced by renowned environmentalist Padma Bhushan Shri Chandi Prasad Bhatt as keynote speaker. Several organization of MoEF&CC like ICFRE, FRI, IGNFA, Directorate of Forest Education (DFE), CASFOS, FSI, WII, BSI, ZSI; Regional Office of the MoEF&CC at Dehradun, IIFM, Bhopal will participate in the event. The Uttarakhand Forest Departmentand ,KendriyaVidyalayaSangathan, Dehardun will also be taking part. Painting and essay competition fort students of Dehradun based Kendriya and NavodayaVidyalayas, photography competition for various forestry organizations and debate competition for FRI Deemed to be University students have been organized to celebrate the occasion. Prize distribution to the winners of these competitions alongwith the ICFRE excellence awards will be given during the event. Two publications namely ‘Coffee Table Book’ on ‘Biodiversity of New Forest Campus’and ‘Compiled profile of ICFRE Scientists’ will also be released. On this occasion an exhibition is also organized to showcase the forest products, eco-friendly technologies, publications, artifacts, organic produce and other livelihood options promoted by NGOs &amp; Govt. organizations/departments at Mango Grove from 10:15 AM to 4:30 PM. To mark this International Day of Forests 2019, a Ceremonial planting by the distinguished dignitaries will also be done at Botanical Garden, FRI. Forestry education is imparted by the ICFRE, ICAR institutes, central and state agricultural universities. There are 21 agricultural universities conducting forestry programmes at undergraduate, postgraduate and doctoral level which are accredited by the ICFRE. FRI Deemed to be University also conducts various post graduate level courses and doctoral programme in forestry. Forestry training is imparted by the Indira Gandhi National Forest Academy (IGNFA) and DFE in Dehradun through its three Central Academy for State Forest Service (CASFOS), Central Academy for Forest Education and six Rangers colleges under state governments located in different part of country.